The Piaggio Porter is a totally unknown vehicle in America. It’s a van, but a micro-van. It’s smaller than a Toyota Yaris. You can’t expect to cross continents carrying heavy loads in one, but in old European cities with narrow streets and tights intersections, the Piaggio Porter makes a lot of sense. It’s also very cheap to run, and reliable, so you’ll see it all over Italy and Southern Europe. It’s also built in India where it has a huge market. There’s an electric version available in Italy, France and some other markets, but it comes with a substantial price increase that prevents it from going mainstream, and some users can’t afford to have their vehicle immobilized for several hours the time of a recharge: their vehicles run 24/7. So an internal combustion engine is a necessity and Piaggio engineers are hard at work designing a new one, with the help of British specialists from Ricardo. Together, they are developing a brand new engine family, a 1.2-liter two-cylinder. It’s a diesel and high output isn’t a priority, it delivers a modest 47-kW (64-hp). What matters is very low fuel consumption, and full compliance with all the latest European emissions regulations. The new engine isn’t certified yet, but we’re expecting that the Piaggio Porter equipped with it should get a 50 MPG combined rating on the European test cycle. This would make it the most efficient commercial vehicle on the planet. 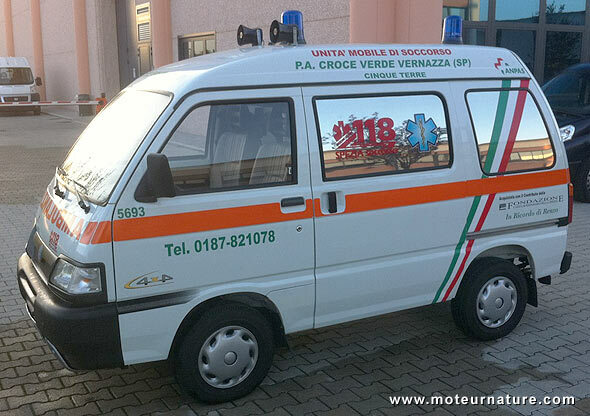 Picture from MAF ambulanze e veicoli speciali.